Jennifer Siebel Newsom's documentary "Miss Representation" had its premiere and rebroadcast on the OWN last week and local screenings are coming to Michigan -- maybe at a venue near you. Thursday, Nov. 3, Main Art Theater, Royal Oak, Mich., 7 p.m.
to benefit the Women's Center of Southeast Michigan. Tickets $18, $8 for students. Contact: Kristen Pursley at kpursley@patentco.com or 248-292-2920.
on the University of Michigan campus, Ann Arbor, Mich., 7 p.m. Presented by Body-Peace Corps,a "University Health Service sponsored student organization whose members are passionate about promoting positive body image and preventing eating disorders." But, the really big event will be Saturday, March 24, 2012, when "Miss Representation" will be the main feature at Oakland University's Women and Gender Studies Film Festival. And there's more. Jennifer Siebel Newsom, the film's writer, director and producer, will be the featured speaker . Dr. Patricia Wren, one of the film festival's organizers, says, "Stay tuned ... we're already looking for a larger venue." OWN spins the film this way: "'Miss Representation' brings together some of America's most influential women in politics, news and entertainment, including Condoleezza Rice, Nancy Pelosi, Katie Couric, Rachel Maddow, Margaret Cho, Rosario Dawson and Gloria Steinem to give audiences an inside look at the media's message and depiction of women. 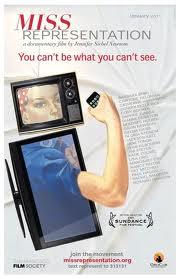 The film explores women's under-representation in positions of power by challenging their limited and often disparaging portrayals in the media. Miss Representation takes the stand that the media is portraying women's primary values as their youth, beauty and sexuality - rather than their capacity as leaders."